After Thursday I will never have to walk into this looking back at me from the crib again. YAY! He has gotten to where he can put up quite a fight when I go to unstick it. Poor little muffin! But YAY for never again (after this Thursday). Hooray for clean eyes (very soon)! So glad you won't have to deal with this anymore! I remember how Ashley fought having her eye unmatted. Not fun! Also glad you won't have to deal with a little tube running out of his eye. That's how they unblocked Ash's tear uct, ut she kept pulling it out. Seeing what looks like fishing line hanging out tof your child's eye is somewhat unnerving! Yay for Thursday! Those little matted eyes are just icky. 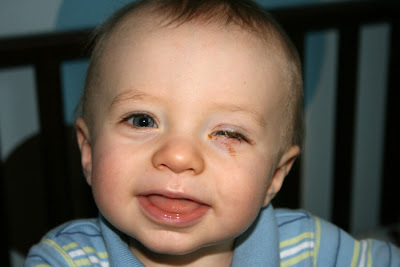 I remember all too well coming in every morning to a beautiful smiling baby with an eye that looked just like that! By this weekend... you will get to see those sweet little twinkling eyes w/ that priceless morning smile! I am so happy for you all! Praying all goes well tomorrow.